The focus of Systems Engineering group is to bring nanotechnology developed at INL into form-factors compatible with applications in the areas of ICT, health, agri-food and environment. The high levels of integration and miniaturization required for such applications can be often achieved via custom-designed microelectronics solutions, in particular CMOS technologies that enable both high-performance and mainstream adoption of the resulting devices. Our mission is to use electronics and microelectronics combined with nanotechnology to solve challenges within the above areas designing and implementing hardware applications that are power, size and cost efficient. 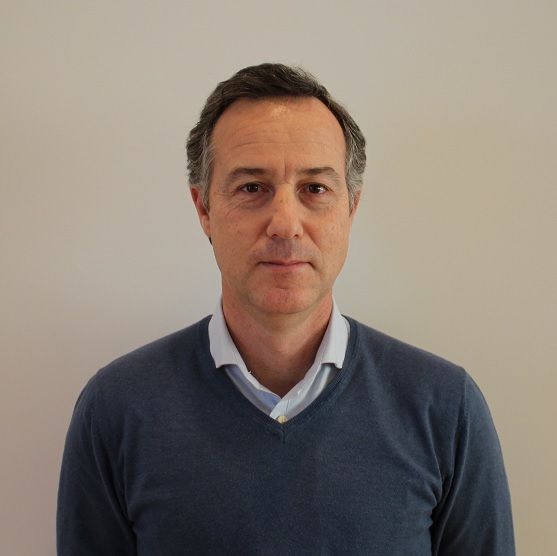 Our aim is to develop complete solutions and systems, either portable or handheld that enable meaningful applications of advanced sensing and actuating technologies in everyday work and life environments. The target level of complexity is integration of these functions into “smart” system-on-chip (SoC) or System-in-Package (SiP) hardware devices. Wafer-level integration of CMOS and nanotechnology (Spintronics, MEMS, thin films) is complex. A major practical challenge in implementing such devices is developing the required combination of interdisciplinary knowledge that is fundamental for combining heterogeneous technologies. We offer unique solutions within the paradigm of more-than-Moore by combining CMOS and nanotechnology in hybrid devices and integrated systems. At the level of technological components, we are developing a hybrid CMOS/Spintronics fabrication process working on the CMOS side and targeting magnetic imaging sensors, magnetic cardiography, and magnetic-particle imaging applications. On the side of integrated systems we developed ASIC Analog Front-End that interface sensors (MEMS). Development of biosensors, biochips, and lab-on-a-chip devices requires a combination of device functionalization, sensing technology, nanomaterials, biocompatibility, and extensive experiments for statistical data analysis and qualification of technology. The group is establishing in combination with other groups at INL the appropriate interdisciplinary expertise in biology, physics, engineering, and electronics, which represents a major challenge for each new project in these application areas. 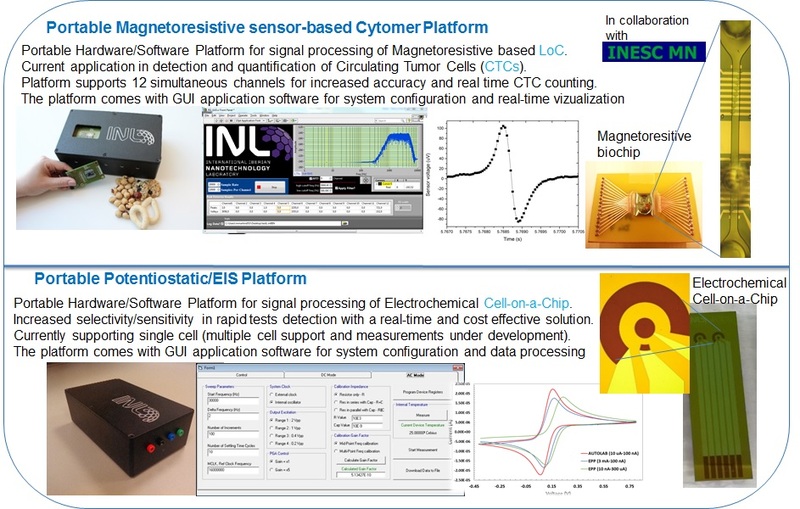 In terms of system-level integration, we aim to develop a comprehensive set of platforms capable of nanotechnology-based detection and diagnostics, in particular via improving the signal conditioning and read-out from advanced sensing devices developed at INL, which include electrochemical impedance spectroscopy biosensors and detectors for circulating tumor cells (in collaboration with INESC MN), both available today. With the advent of IoT (Internet of Things), system level integration of Ultra Low-Power Wireless technologies has become paramount for sensor network communications (short, medium and long range). Nodes must be power efficient, reliable and working standalone for long periods. We are developing the baseline wireless technology for detection, monitoring and transmission of physical sensor information, addressing protocols, ranges and power consumption in BAN, PAN and Mesh style networking. This is being applied to the development of IoT devices for well-being and health monitoring of elderly people targeting various health conditions (heart, cronic diseases, etc. ), precision agriculture and asset tracking and protection. Another development taking advantage of such networking integration is the remote water quality monitoring system (Multi-platform system integration with Wireless communications support) in which we take our LoC platforms into a fully integrated, standalone water monitoring system (with other partners). The focus of System Engineering group is to bring nanotechnology developed at INL into form-factors compatible with applications in the areas of ICT, health, agri-food and environment. 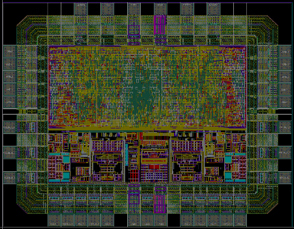 The high levels of integration and miniaturization required for such applications can be often achieved via custom-designed microelectronics solutions, in particular CMOS technologies that enable both high-performance and mainstream adoption of the resulting devices. Our mission is to use electronics and microelectronics combined with nanotechnology to solve challenges within the above areas designing and implementing hardware applications that are power, size and cost efficient. Wafer-level integration of CMOS and nanotechnology (Spintronics, MEMS, thin films) is complex. A major practical challenge in implementing such devices is developing the required combination of interdisciplinary knowledge that is fundamental for combining heterogeneous technologies. We offer unique solutions within the paradigm of more-than-Moore by combining CMOS and nanotechnology in hybrid devices and integrated systems. 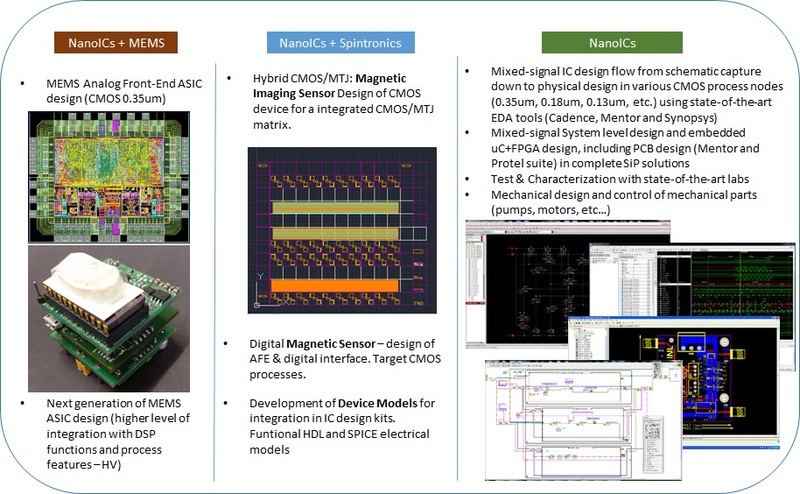 At the level of technological components, we are developing a hybrid CMOS/Spintronics fabrication process working on the CMOS side and targeting magnetic imaging sensors, magnetic cardiography, and magnetic-particle imaging applications. On the side of integrated system we developed ASIC Analog Front-End that interface sensors (MEMS).